I’ve just returned from an amazing artist-in-residence experience at Necedah National Wildlife Refuge. I’ve printed a copy of my new (“Wetland & Slough”) manuscript, in the hopes that I’ll find time to do revision work while it’s all fresh in my mind and heart….. I’ve had my chainsaw repaired…. and I’ve repacked the truck. Now I’m heading up to a wildlife refuge of a more remote sort, on the Yellowdog Plains, where I’ll spend the rest of the month fixing things — repairing chink (mortar) between old logs, staining a wood floor, repairing squirrel-damage, resealing joints and gaskets on a couple cast-iron stoves, etc. I’ll also be sharing a campfire with dear old friends from Minnesota, blazing a new hiking trail, planting seeds, cutting firewood, peeling logs, and laying the foundation for next year’s building project. Flocks of Canada geese and Sandhill cranes will be heading south… at night I’ll play the Victrola, listen for timber wolves and watch the skies for the Orionids, and maybe I’ll see a moose some morning! While I was down at Necedah, the clearings from our 2009 timber cutting were finally replanted — here is a beautiful photograph showing lush green flats of pine seedling plugs, taken by June Rydholm! Red, white, and jack. I believe they planted some tamarack, too? Now all we need is rain (forecast for tomorrow), to help set those baby seedlings and give ’em a good drink before winter sets in. 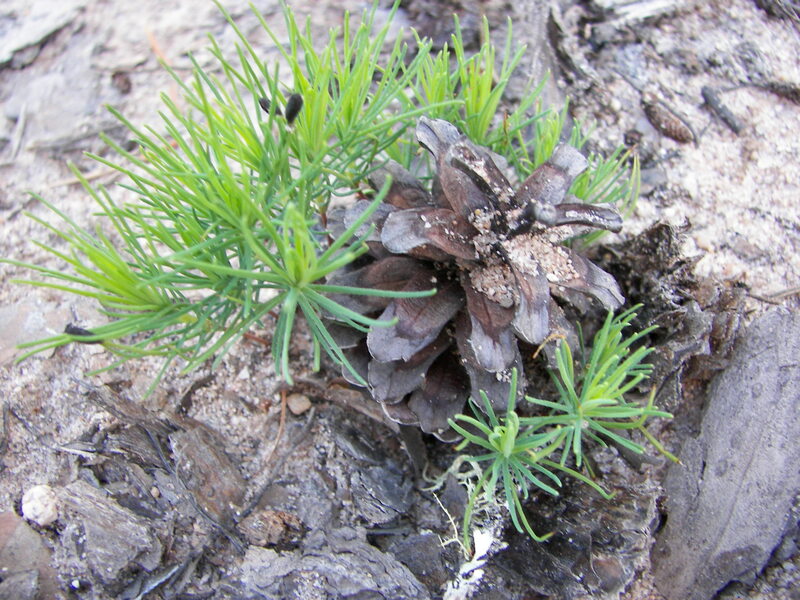 Note: the dying jack pines scattered their cones, even as they were felled and dragged away. Now fragile green jack seedlings are sprouting everywhere, thick as moss around the mother cones: natural reseeding. It will be a great pleasure to watch all these trees grow up over the course of my lifetime.